Have you ever wanted take a look inside the mind of a genius? Possibly get a glimpse into how they think and view the world? I certainly have. Fortunately for us, historian Toby Lester provides us with such an opportunity. After scouring through one of Da Vinci’s many journals, which he often used as a commonplace book of sorts, Lester found a page that seemed to be a to do list for a week or month, back in the 1490’s. Below is an illustration of what that to do list looked like, as well as a glimpse at the original. Illustration (left) by Wendy MacNaughton. 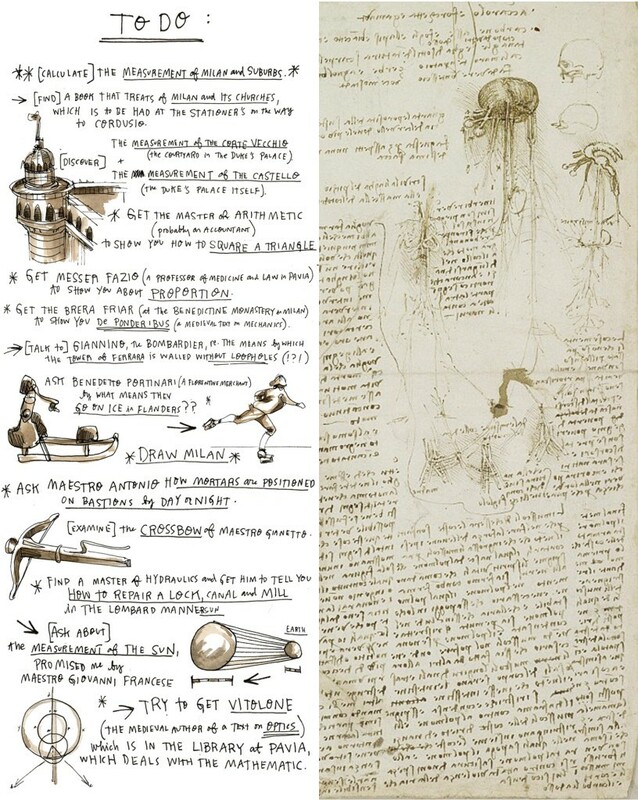 Original (right) from Da Vinci’s notebook. It’s quite the list and there are a few things we can infer from what we see here. The array of thoughts and ideas here is pretty incredible. From his various measurements of the city to drawing all of Milan to understanding how to square a triangle, it’s broad and scattered. 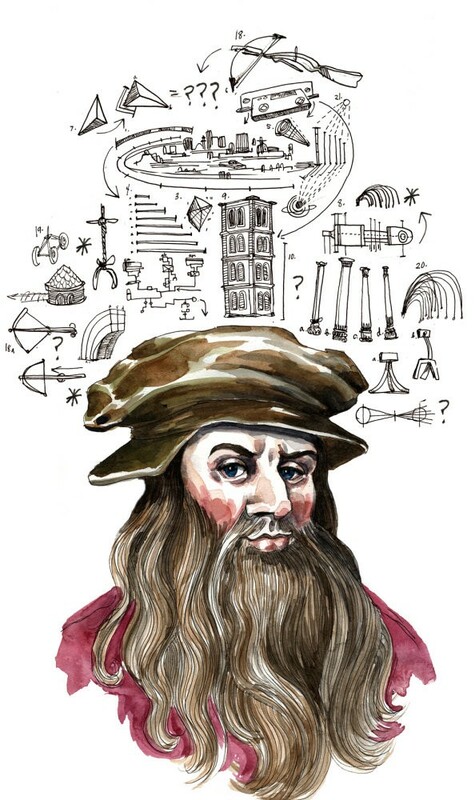 If there’s one thing we can say, Da Vinci followed his curiosity wherever it took him. Calling him THE Renaissance Man is certainly supported by this meandering to do list. A key approach by Da Vinci was that he didn’t act as if he knew everything. He realized that other experts knew certain things far better than he, so he sought them ought to acquire new knowledge. He would travel far and frequently to pick the brain of a wide range of people, from medical professors to fellow authors and inventors. If he didn’t understand something, he found people that did. Despite being a master painter, Da Vinci clearly didn’t focus on just his painting. He was as unfocused as they come and explored a broad range of things on a regular basis. If you look at this list, only maybe the drawing of Milan falls into the artist bucket. This wasn’t just a way to procrastinate though. The benefits of a wandering mind can unlock our creativity and give us a break from our more intense work. Perhaps we can take a page out of Da Vinci’s book and realize that being distracted by things that catch our curiosity is actually a worthy endeavor. What would Da Vinci do if he were alive today? It’s an interesting question, but one thing is certain, he’d certainly save a lot of time. Back then, the things that Da Vinci spent his time on were legitimately taxing endeavors that required real effort. What’s crazy is that our smartphones can empower us to accomplish 90% of these tasks quite easily. The ability to communicate with people across the world, let alone within Italy would save hundreds of travel hours alone. Furthermore, being able to query specific information in seconds would quench many of his random curiosities. Many argue that the way of the generalist is out of reach today, simply because of how vast information and knowledge has grown over the years. I believe the opposite. I think that technology has kept pace to allow us to continue to follow this path if we so choose, and do so wisely. The opportunities we have today are incredible. We have become empowered to create and be creative if we choose to. On top of that, we can learn from anyone and everyone, whenever we desire. Sure, there will always be more to learn than possible, but that shouldn’t deter us from chasing knowledge constantly. If Da Vinci is happy to travel 200 miles from Florence to Milan, just to learn about mechanics because it interests him, what excuses do we have not to hop online and explore a new subject? Follow your curiosity, always be learning, wander a bit, and discover how amazing the world truly is. The evolution of the generalist.